This is a letter I hoped I would never have to write. When we started TAKE BACK YOUR TIME five years ago, I believed our idea was so needed, and would receive such a positive response, that we would have little trouble raising funds to keep at least a minimal infrastructure functioning properly and at least a few staff people able to make ends meet while working for the cause. Well, I was right about our potential popularity–since 2002 thousands of people have joined our group and the number of articles written about us and radio interviews our board members have done far exceeds a thousand, including coverage in all the largest newspapers and other media outlets in the country. More than 200 communities have held Take Back Your Time Day events, many for several years. Altogether, more than 10,000 of you have joined our email list, and more than 3,000 of you regularly open our emails and read our newsletter. Your comments and response to our inquiries have played a major role in our project priorities. Most recently, you have responded with an outpouring of emails supporting our vacation campaign. So I was right about that. But I was wrong about the money–foundations have not yet supported the important work that we do, despite no lack of effort on our part to reach them. And while we’ve gotten $30,000 from two corporations–Beringer and Panera–it just hasn’t been enough. So we have relied on you, our members, to keep us afloat and to tell us what you wanted us to do. Over the years, you have provided just enough to keep us going, but in spite of that we are facing the most severe financial crisis in our five year history. The result is that if we do not find a way to raise some support soon, we will no longer have phone service at the end of the month, and our hard-working Executive Director, Lisa Stuebing, will need to look for more gainful employment, as our previous director, Gretchen did before her. Lisa has already taken on temporary work. Remember, we are a very lean organization, with only one modestly-paid, part-time staff person, with an office in her home. Yet look at what we’ve done with that. In order to function sustainably, if not at peak performance, we need to raise about $2700 a month. This includes staff time and the actual cost of our physical operations– office supplies, webmaster, emailing etc., which Lisa tells me is $465 a month. Our board is generously pledging to cover the non-staff minimum costs, but we cannot continue to function if we lose our Executive Director. We are facing a real crisis and we will not survive much longer without your contributions. We know that times are tight and the many of you cannot give much but we hope you will be as generous as you can. As you begin to make your fall contributions to the organizations you believe in, please consider Take Back Your Time. If every one of you that opens this email contributes just $25, we will be sustainable for the next year. If you can give more, please do. Consider making a pledge. Please don’t let this organization die. I think you know what we’ve accomplished. We are the go-to organization for all reporters looking at issues of time poverty and work-life balance. We have helped with campaigns for paid family leave and other needed reforms. Our materials and ideas are used in college classrooms throughout the country. Our new vacation campaign is attracting wide interest and we will be letting you know about some of the exciting new things that are happening with the campaign in the very near future. Joe Robinson and I addressed the Indianapolis convention of the National Parks and Recreation Association last month and have been speaking to many groups about the need for vacation protection in the United States and we want to involve more of you in this activity. Please let us know if you can help! The media is wild about this and Joe has been meeting with Congressional staff people and finding strong interest in our idea. A political consultant for a sitting governor called me recently and said his client’s chief of staff and policy director were eager to meet with us to talk about this. We are getting some real interest from adventure travel firms which I hope will lead to new partnerships like those with Beringer and Panera, in the near future. We don’t want to stop there, either. With sufficient financial resources, we can do many other things–improve our newsletter and send it out more frequently; sponsor conferences and teach-ins; encourage polling, research and more effective framing of our message; take on other issues in our Time to Care campaign; build greater connections to health, family, environment, social justice, civic and other organizations. I am honestly convinced that if we can survive through the coming winter, this organization is on the verge of a major change in status. It would be a shame for this organization to die just as it seems about to make a major impact on our country. But I will not sugarcoat the truth–if we do not receive your support, Take Back Your Time will not continue to function as an organization. Please help now. Thanks so much for all you do. 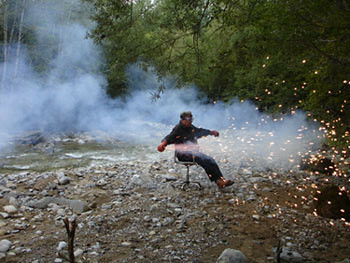 This is a still from a video by Roman Signer and it is being used as the signature image for his exhibition on now at the Fruitmarket Gallery in Edinburg, Scotland (http://www.fruitmarketgallery.co.uk). I discovered it via an e-flux announcement. While I’m posting, why don’t I give you an update on what’s going on with us? We’re doing well! We’re just about finished discussing the budget and we’re starting to fund raise and turn our attention to working out details such as travel and accommodations, and the sites for artists interventions. The exhibition opens on June 14, 2008 with a reception on June 13. Some days it seems like a far way off, but when juggled between other responsibilities, it becomes apparent just how soon it will launch. I’m getting excited, and so are many of the artists. More information will be posted here as soon as it becomes available, so please feel free to stop by anytime!